Cargo built 1904 Howaldtswerke, Keil. Owner L G Sergo & Co., Tallin. 671Gt. L195’. B25’1”. Dr 11’4”. Ervice between Talin and Helsingfors. Formerly on Hambur and heligoland service as ADLER (ex SEEADLER). St Olviste Church and Custom Building are on the left foreground of stamp, flour mil on right of stamp. (This identity was first made by Officers and crew of SULEV at Liverpool, Dec 24 1939. Was subsequently confirmed by the owners. – Estonia SG139. Built under yard 392 by the Howaldtswerke at Kiel, Germany. 08 Oct.1904 launched without a name, she was ordered by Kiel interests, who did not take delivery of the vessel. Tonnage 594 gross. Dim. 195.0 (between pp) x 25.1ft. After completing in Jan 1905 used by the builder for machinery trials. Then laid up until sold and refitted. Got passenger accommodation for 30 first, 40 second and 100 steerage. 07 July 1912 acquired by Hamburg Amerika Linie (HAPAG) at Hamburg renamed ADLER. Tonnage 563 gross, 202 net. She was re-engined with a triple expansion steam engine 93 nhp., speed 11 knots. From Nov 1914 until Nov 1918 requisitioned by the German Navy and used as a rescue hospital vessel. 1935 Sold by HAPAG to Louis Köster, Hamburg-Altona, renamed SEEADLER. The same year already sold to Laevaühing G.Sergo & Ko., Tallinn, Estonia, renamed AEGNA. Used in the service between Tallinn and Helsinki. 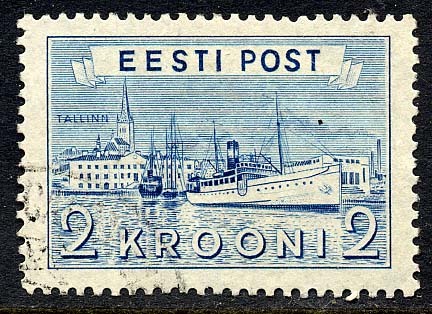 Seized by the Russians in June 1940 after the annexation of Estonia. Captured by German forces in port in June 1941, used as a pilot tender. 28 Nov. 1944 when at Klaipeda she was captured by Russian forces. Around 1946 renamed in VOLKHOV under Russian flag and registry. 1951 Deleted from Lloyds Register under the name AEGNA. Sources; Hamburg America Line by Duncan Haws. Register of Merchant Ships Completed in 1904.